It's a new year once again. I turned 24 five days ago and much to my surprise, I feel like I'm a whole new person as I have reached this age. I seem to have grown so much in the past year and it's been quite a ride. 24 years of life and I am still here. I thank God every day for His many blessings, His never-ending love for me, and for just giving me the chance to exist in this world. 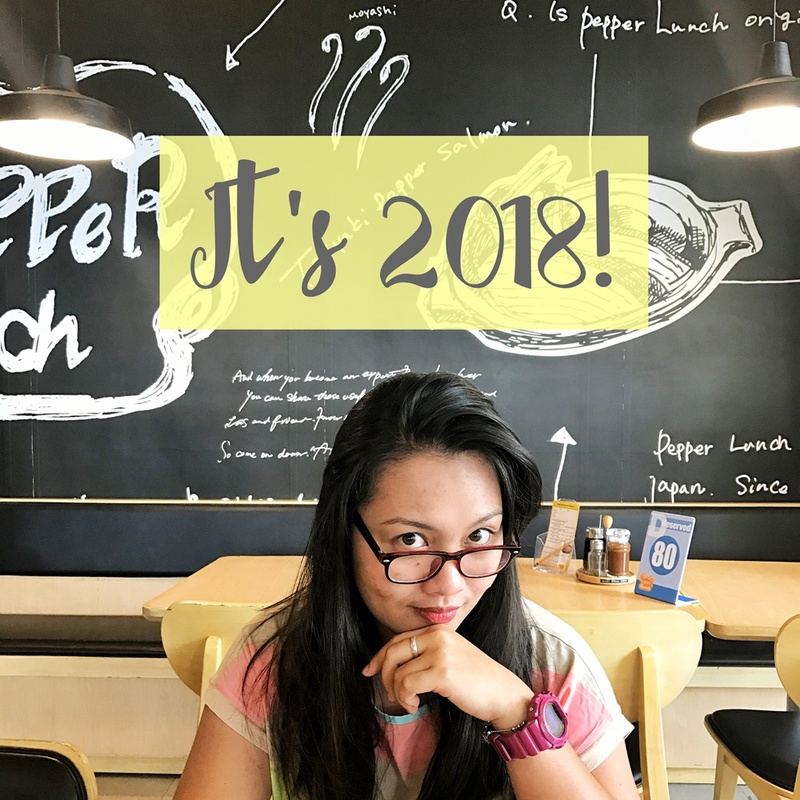 2017 has been a year of experience and realizations and was a roller coaster ride of personal growth and development. I have no doubt that 2018 will also be another heck of a journey. Though I hope this time around, it will be better than the last. 2017 was fun and just in between. I had great times last year and I realized that the things that happened needed to happen to bring me to where I am today. It feels great to have come out alive from 2017's hands. I wonder what 2018 has in store for me. I'm excited and, at the same time, scared about the endless possibilities that will come stumbling my way. While I am thinking about what to write in this post, I keep looking back to what I have written exactly a year ago today. I've always made plans and map out my year. On what I want to happen, on the places I want to go, on the things I want to do, on the goals I want to achieve. This doing gives me high hopes and gets me into expecting for things to go the way I envision them to happen in my head. And when my expectations aren't met, I spiral down the disappointment lane and overthink. Over the new years that have passed by in my life, I've always written down my "New Year's Resolutions". I've always set idealistic goals that I know deep in my heart I wouldn't have the strength and perseverance to accomplish. And these resolutions will just stay as resolutions I wrote in a piece of paper, repeatedly year after year. This 2018, I wouldn't make concrete plans, I wouldn't go over the top, I will just go with the flow and wing it. Means I should lessen the junk that I intake. Which means no more junk food like soda and chips, and lessen eating out at fast food chains (goodbye fries). Yes to more greens, fruits, and veggies. I'm hopeful I can do this. Go back to Boxing and Jogging; Get Physical! Last year, I was able to go to the boxing gym for 2 months at 3 times a week. Sweating out was the best feeling and my body felt lighter and stronger. When the Marawi Siege happened and the martial law was implemented, I stopped and I haven't been back since. I need to return and have this aspect back in my life. So I'm making it a point this year to finally get back to getting physical. I thought my mood swings and temperament changes were normal but as time went on, I developed anxiety, got panic attacks and got depressed easily when overthinking. I want to take care of my mental health more this year so I don't spiral down into another depression attack. I've written for a mindfulness website last year and I learned a couple of helpful things from that job. I am deciding to embrace that way of living and start practicing mindfulness this year whenever I can. I admit, when I first got a job and started earning money for myself, I went ballistic on buying stuff I have always wanted and console myself with the "treat yourself" words when I feel guilty after the impulse-buying session. After 2 years of working, I still don't have money saved. So this year, I am putting a stop to mindless spending and extravagance, and start putting an effort into actually saving up. I plan to just buy the things I really need and not go crazy when there are sales and stuff. No more impulsive and mindless buying. I'm going to strive hard to save money FOR REAL this year. This is always a priority for me. Spending quality time with my loved ones and making new memories with them is one of my many joys. I hope and pray 2018 will bring us all good fortunes, exciting challenges, and more memories to look back to when we're old. Life is tough, but so are we. Let's make the most of our lives and continue to strive up for the better!